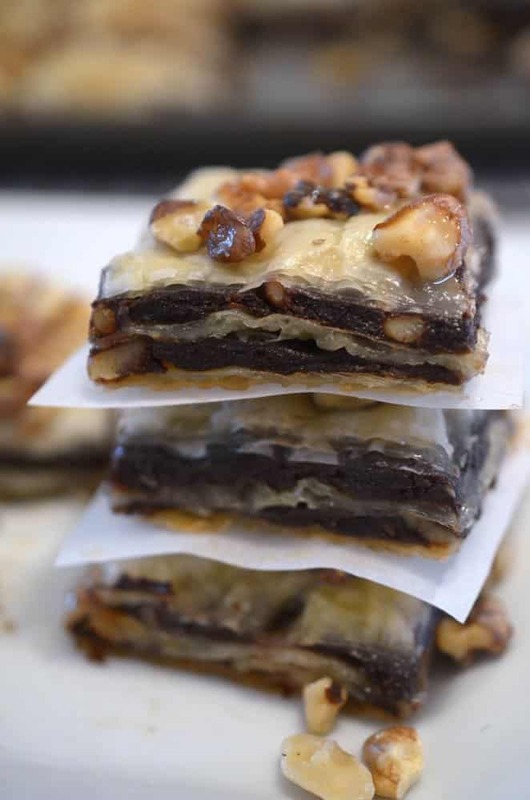 Chocolate Brownie Baklava – New decadence in an ancient treat. Baklava is among the oldest and yet modern day delicacies known to us, dating back to the 13th century in Turkey where some believe that it originated. Others dispute that claim, saying that it is an ancient treat enjoyed by the Romans and subsequently enjoyed by the Byzantine empire. Honey and nut based sweets were popular all those years ago and remain popular to this day. I can’t help but wonder what those folks would have thought of this treat if they could see and taste what we did to it right here in Neenah, Wisconsin in the year 2015. We added chocolate. I can’t think of too many things that chocolate doesn’t make better. Chocolate milk, chocolate covered peanuts, chocolate covered grasshoppers (just checking to see if you’re reading,) and now: Chocolate baklava. We had some leftover fillo dough from the Greek Chicken and Rice in Fillo Dough post we put together a couple of weeks ago. 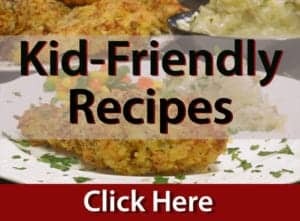 We’ve worked with fillo in the past, including the delicious Brat Bites we did a year or so back and I wanted to find yet another recipe to make using this paper thin pastry. Many people have mentioned they are reluctant to use fillo dough because it intimidates them. I call it fear of fillo syndrome (FFS) and like many other things that we are afraid of it is best dealt with by simply facing this fear. Or in this case, facing the fillo. One of the secrets of using fillo is to work quickly, and keeping the stack covered with either a plastic wrap or a moist towel when removing individual sheets. It will dry out in a matter of seconds if this is not done. Adding “moisturizer” to the fillo is perhaps the very best part of any recipe that uses it. What is used to keep it from drying out as it is being used? Good ole’ butta. And lots of it. This recipe however uses a key ingredient that some, including your truly, may consider even better than butter; that would be chocolate. 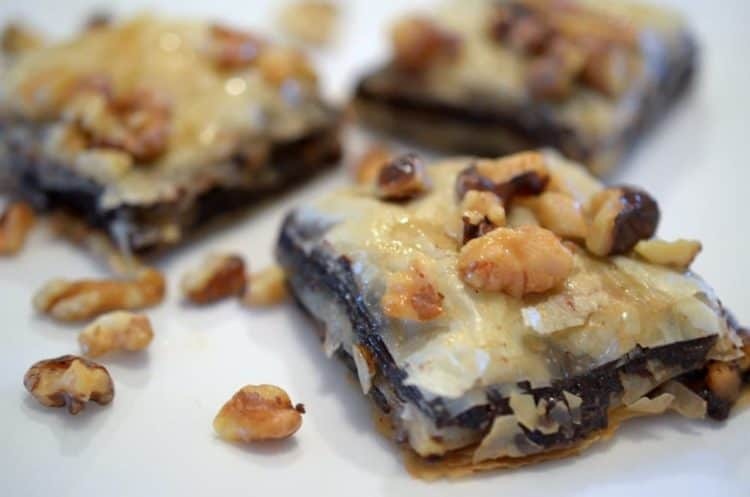 The chocolate, when combined with the walnuts and fillo slathered in butter, takes this ancient treat to a new level of decadence. It’s a new use for chocolate and one more method of losing your fear of fillo. A new decadence in an ancient tree. Recipe from Gold Medal Flour. For the brownie batter melt the butter and chocolate squares in a large microwave safe bowl for 2 minutes, stirring every 30 seconds, until completely melted. Let cool slightly before stirring in the sugar. Beat in the eggs and vanilla until well combined. Stir in the flour and cinnamon. Fold in 1-1/2 cups chopped walnuts. Set brownie batter aside. Roll fillo dough out onto a work surface. Place a 9x13-inch baking dish in the center of the fillo and cut around the edges with a sharp knife so that the fillo sheets are shaped to fit the dish. Cover the fillo with a damp cloth while you are assembling the baklava. Melt 1 cup butter in a microwave safe bowl. Spread the bottom and sides of the 9x13-inch baking dish with some of the melted butter. Place a sheet of fillo in the bottom of the baking dish and brush generously with the melted butter. Repeat with 6 more sheets of fillo dough, brushing each sheet with melted butter.. Spread half of the brownie batter evenly over the 7 sheets of fillo that are in the bottom of the baking dish. Layer 6 more sheets of fillo dough, brushing each sheet generously with melted butter, on top of the brownie layer. Spread the remaining brownie batter over the middle layers of fillo dough. Top the second layer of brownie batter with the remaining phyllo sheets, brushing each sheet with melted butter. 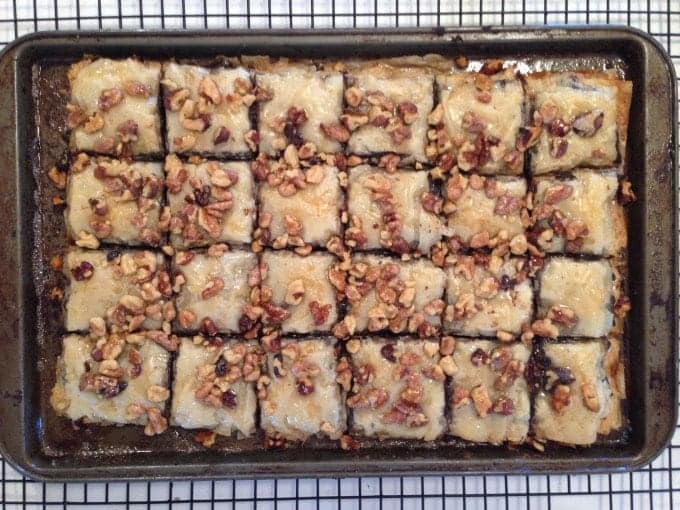 Using a sharp knife, cut the unbaked baklava into 24 squares. 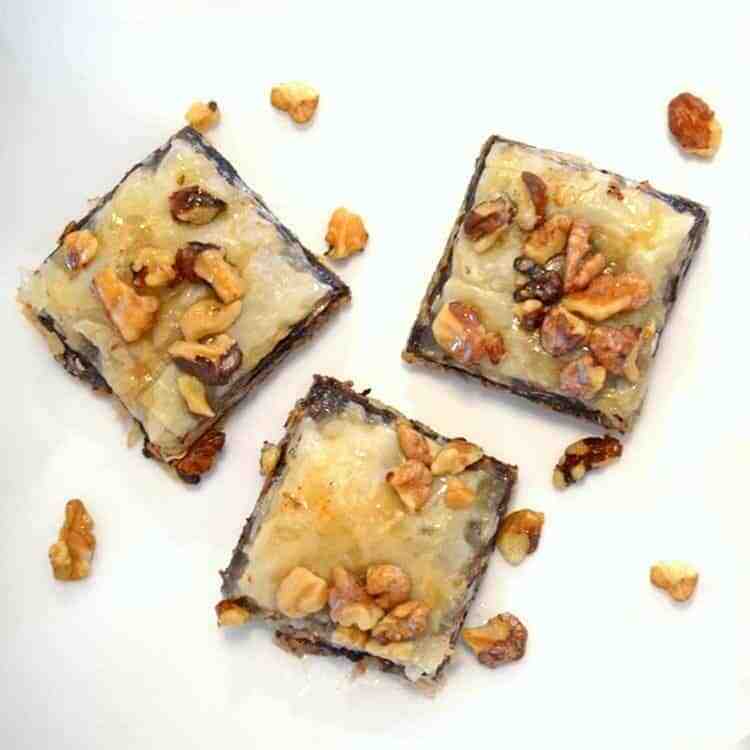 Brush with remaining butter and sprinkle with remaining ½ cup chopped walnuts. 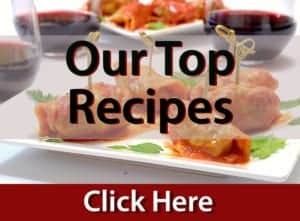 You have put two great recipes together here, Genius idea! I wasn’t hungry until I saw this! OK…so is this awesome or what!!! Two delicious desserts rolled into one YUMMY creation. Sound totally addictive…and you will for sure want more than one piece!! NOH-MY_GAWD!!! 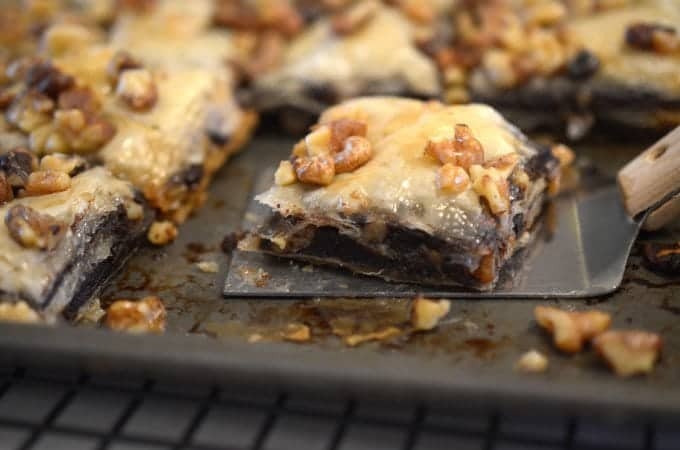 You did not just combine brownies with Baklava!!!! I’m going to dieee!!! And FFS (you are a darling for giving it a name, now I can tell people about it) – It is so real, isn’t it! I live in perpetual fear of it! Chocolate does make everything better and these look mouth watering. Haha, I definitely suffer from FFS. But I will have to overcome it in order to make this DELICIOUS-sounding baklava, because CHOCOLATE, hello. And lots o’ buttah? Sign me up! 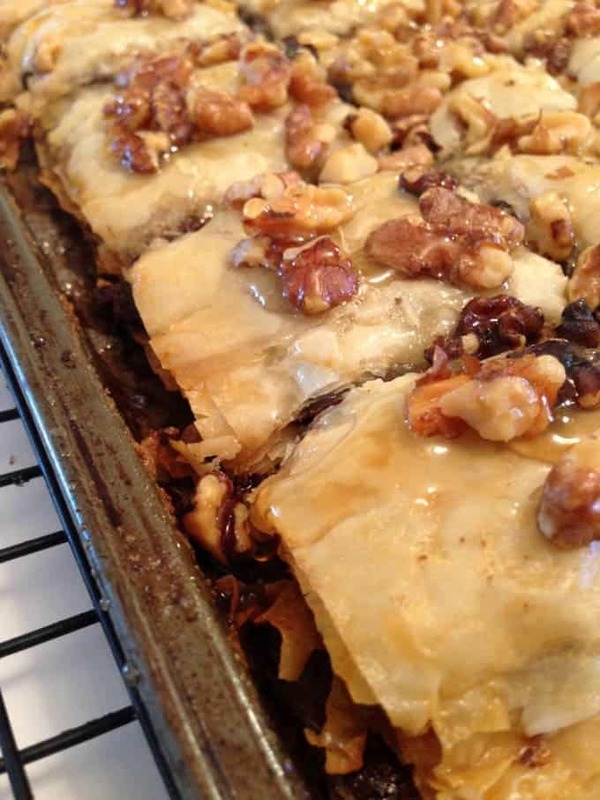 We ate some amazing baklava when we were island hopping round Greece, but nothing like this. What an amazing flavour combo. Two of my favourite things in one recipe. Heaven. Two of my favorite desserts! This sounds out of this world! I MUST try this recipe ASAP. 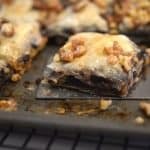 Baklava is one of my favorite desserts + Brownie = Magnificent Idea!!! Congratulation guys on this post!! These are not only best but also a killer one. Delicious brownies, love it! Thanks so much, we loved this one! This idea of a dessert is just genius. 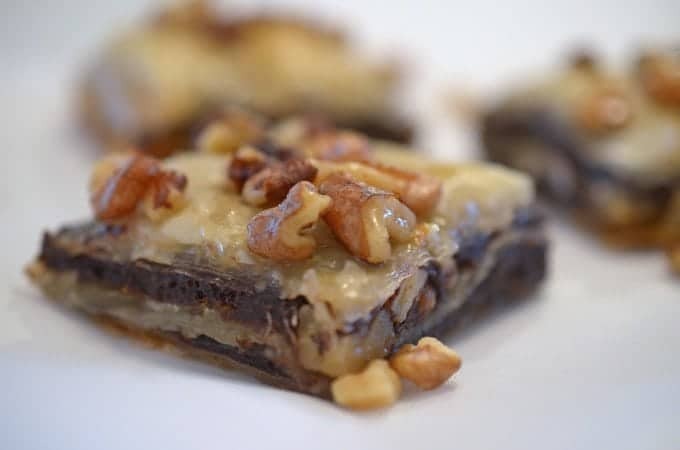 You are a genius for sharing this recipe and I am going to be a genius when I make and share it at my next holiday party. Woo! Once again, you’ve got me! This looks delicious! I cannot wait to try it! Wow these are so decadent! I bet these taste amazing! oh hell yes! love that you combined baklava and brownies! I’m pretty sure you’re my kinda gal, Evi! What a genius combination of two of my favorite desserts- I would be thrilled to find this on any holiday dessert table!! Thanks, Jessey; we were please how this one came out! Wow, this is nothing short of spectacular! Pinning and sharing! Two of my favorite desserts combined together! Love this! That seems to be the consensus with this one! This looks so decadent! Everything is better with chocolate, right? I am a fan of Baklava but I have never tried adding chocolate to it. You are right, though, chocolate makes everything better so I am surely trying this! Igor, you’re going to love this!